This elderly lady was unable to stand, or walk due to incapacitating back pain. She had degenerative disorder of the lumbar discs leading to retrolisthesis and diminished disc space along with interspinous laxity and instability. 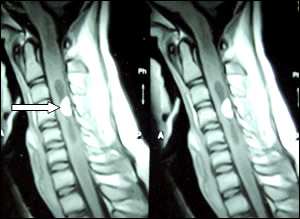 She underwent an interspinous dynamic stabilization with DIAM at L4 and L5 interspinous area. This is a synthetic flexible implant (Medtronic Inc.) that allows a dynamic stabilization of the interspinous area in such cases and a symptom free life. Interbody fusion and pedicular fixation need not be done in such cases as these are essentially non dynamic fixations. She was pain free with no gait abnormality.